Who doesn’t remember those golden afternoons when you came home from school to a snack of a rich, sticky homemade cake? Just thinking about golden, buttery sponge, or sweet, ruby red cherries studded in a soft, almondy crumb, is enough to have you longing to revisit your childhood. So we’ve picked out our top five after school cakes, so you can give the kids a real treat when they get home ravenous after a hard day in the classroom. If yours are a bit older, then a slice of sticky cake and a cup of tea could be the ultimate revision aid too – after all glucose (found in cake, amongst other things) is brain food! 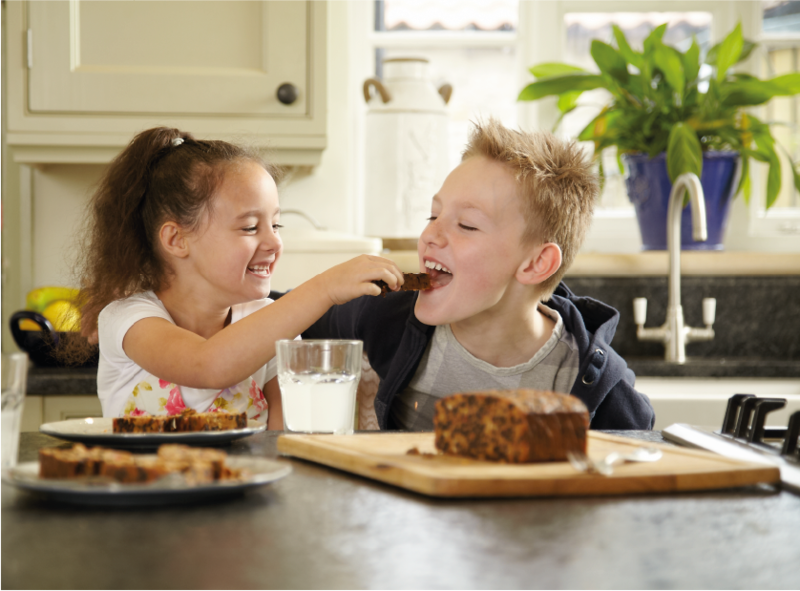 Fussy young taste-buds can rebel against new flavours, but even the most picky child can’t fail to be tempted by a slice of Butter Madeira Loaf Cake. This traditional English cake was once paired with the synonymous sweet wine, but the sweet, buttery flavour of this golden sponge, goes just as well with a glass of milk or a cup of cocoa for a yummy after school snack. The combination of scarlet chunks of sweet, juicy cherries and dense creamy almond sponge, ensure that Cherry and Almond Loaf Cake is a teatime classic. It has been baked for decades and recipes regularly crop up in Yorkshire cookbooks from years gone by, and its just as delicious today. A slab of this delightful cake is sure to put a smile any child’s face and give them just the boost they need to tackle their homework. A traditional Yorkshire farmhouse cake, the Teatime Fruit Loaf Cake, is a soft golden brown sponge studded with dried fruit, cherries and candied peel. Each slice is loaded with fruit making it a temptingly sweet treat for children and grownups alike. Why not join your children and use snack time to catch up on their news, as this cake goes down really well with a nice cup of tea? If you want to give you children an old school treat then introduce them to a bygone favourite – Granny Cake. This cake was popular when food was rationed during WW2, but its frugal ingredients make it a healthier option today too. It is egg and fat free, and thanks to a generous helping of currants, raisins and mixed peel to add sweetness, it contains less sugar. But just because its healthier, doesn’t mean it’s not delicious too and this golden brown fruit cake is a tasty snack on its own or served warm or toasted with plenty of butter. The traditional recipe for our Reduced Sugar Fruit Loaf Cake has been adapted to cut back the sugar content, relying instead on the natural sweetness of plump currants, raisins, cherries and mixed peel. Dried fruit can also go towards the Five-a-Day portions of fruit and veg we are all supposed to eat and it’s also packed with fibre and antioxidants, which help to keep us healthy. This is great news as it means this fruity sponge is a delicious way to get some goodness into the kids, without overloading on sugar. Discover our full range of delicious Yorkshire farmhouse cakes and fruit puddings and buy all of these scrumptious after school treats in our online shop. Just pick your favourites and we can deliver all the homemade taste of classic teatime treats direct to your door.